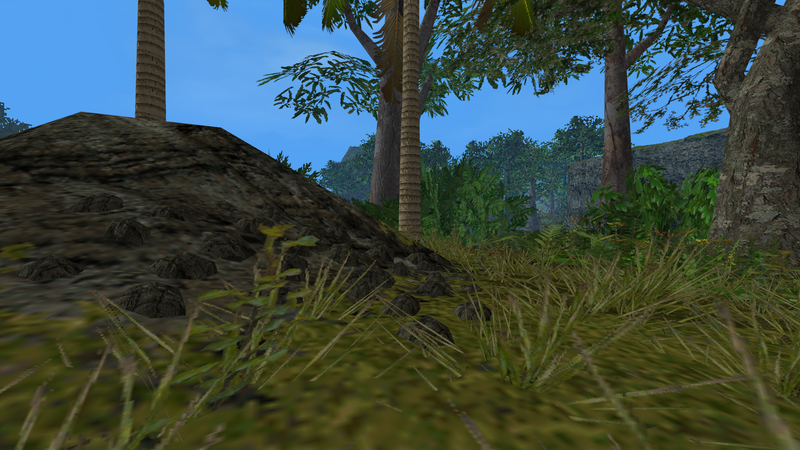 TresCom Forums • View topic - TI's Mega Jungle (Resource) - Released! TI's Mega Jungle (Resource) - Released! Post subject: Re: TI's Mega Jungle (Resource) - Released! ...Holy Raptor Jesus TI, those pines are still way over-poly. I'm going to employ them in limited amounts atm but are you sure there's no way to make them closer to 500-700 faces? FPS gets a little low even just with the small area in MegaJungle..
Prooobably not, I'm afraid, without redoing them from scratch, which might end up being the only solution. The problem is that I made the branches overly high-poly and didn't really realize how far I was going using 8-sided cylinders everywhere. Once I started I thought "hey, these are some nice trees...but they'd be nicer with some of this...and this..." and eventually it got out of control, hence all the 3D branches. Haha damn. Well I've portioned them in SiteC in a way that they don't seem to bring down FPS, so, no worries. This is the weird, boxy JPOG allosaurus model heavily modified to look more realistic and sleek, and scaled down to a more realistic size so that he doesn't dwarf the tyrannosaurus. 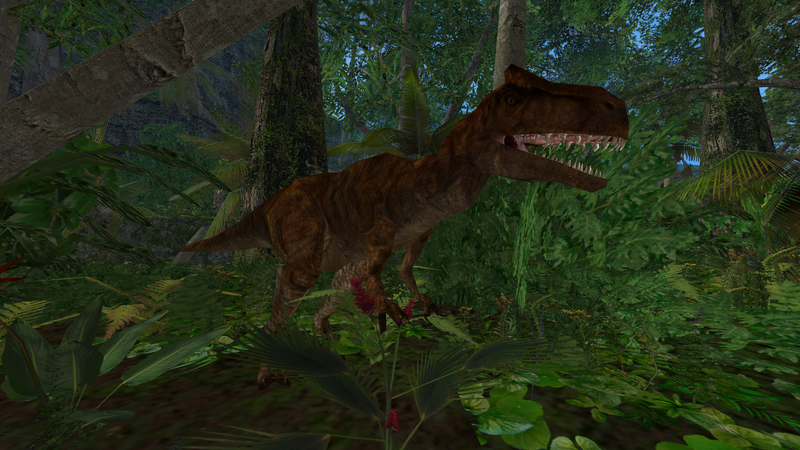 The skin pattern (which of course is in HD with normal maps) is based on the allosaurus from the Lost World PS1 game. I do eventually plan on giving him brand new teeth as well and fixing a few of the minor mistakes in the skin, but for now I think he looks mighty fine! Wow! I like the TLWPS1 sourcing. Thanks. I always wonder why we don't source that game so much, it has some really nice locations and enemies! That allosaurus is one of my favorite dinosaurs in any game...in fact, I like basically every dinosaur in that game, except for those damn dimorphodons. If we could extract the models, I bet they would look good alongside the original Trespasser dinos if we gave them better textures. Here's a new MegaJungle update for the Trespasser 20th anniversary! This one has some new usable Hawaiian Palms as well as the allosaurus I teased a while ago, plus a brand-new (but unfinished) willow tree, which I intend to eventually be part of a swamp-themed set of foliage. Additionally, the evergreens are now lower-poly so hopefully they won't destroy your performance so much. Going to download it into a while... maybe I'll play it later tomight, before going to sleep. TI, your contributions to Trespasser assets in various ways continues to be appreciated. Your level makes a beautiful but deadly addition to Jurassic Park. Hmm, it's playable on my end. Do you have the draw distance turned up at all in CE? It definitely won't work in that case. Otherwise I can't really say what might be crashing it, other than that the level is simply so detailed that it might not work on some PCs unfortunately. It's intended more as a modder's resource than an actual level anyway, the important thing to me is that it works in TresEd. I really don't like the draw distance boost, I figure that if the level has its own CacheDist values on objects, those are there for a reason. The MegaJungle foliage all have CacheDist values anyway so that they should still look good from a distance. You won't be able to play any of my levels with the draw distance up beyond 50 maximum - I would seriously recommend turning it down when you want to play a high-detail level like MegaJungle, Tres Legacy or JPDS...it just makes the game so much more unstable. Proper 3D grass that doesn't look out-of-place, destroy your framerate, or take hours to place manually! Also tiny detail objects like the small, intangible 3D rocks which will be useful on other terrains in order to make them look 3D. I plan on making similar objects for dirt, sand, jungle, etc, as well as new groundcover objects to replace the repetitive jungle ones I've been using up until now. Currently I have the Culling Distance for these objects set to 75, but I think I can knock it down to around 40-50 without creating any pop-in due to the dense nature of MegaJungle. The grass and rocks are available in large, medium and small (single) squares which can quickly be placed in a grid and copied over areas of terrain. You still have to fix grass when it's placed on a slope manually, but I managed to cover a very large area in 5 minutes using these grids. There are also tall, short, and trimmed versions of the grass to create some variety - they can be used in conjunction to make things look even more realistic as grass becomes taller further away from civilization. That grass looks pretty cool, T.I.